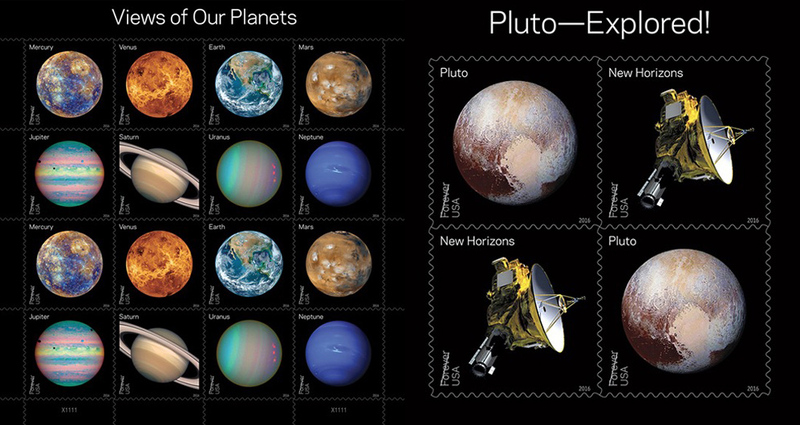 New Planet and Pluto Stamps Available Today! They’re here and they’re from outer space! The U.S. Postal Service has two new sets of Forever® stamps based on NASA’s exploration of the Solar System: the Views of Our Planets and Pluto—Explored! series, both of which become available for purchase on May 31, 2016. Designed by Antonio Alcalá, the Views of Our Planets stamps feature eight images of the major planets in the Solar System, as seen by various spacecraft over the past three decades. Pluto—Explored! highlights an extended-color image of the distant dwarf planet and a rendering of the New Horizons spacecraft, which gave us our first good look at Pluto in July 2015. The last stamp to feature Pluto was a 29-cent version issued in 1991, which showed a featureless tan orb with the words “not yet explored” beneath it… we can now officially call that version obsolete! Both sets are Forever stamps, which means they are always good as first-class postage for 1 oz. envelopes, whatever the current postage price may be. You can purchase both in collectible sheets at your local U.S. Post Office or online here. *Note: the Pluto stamps are only available online. It’s about time little Pluto was given his due.